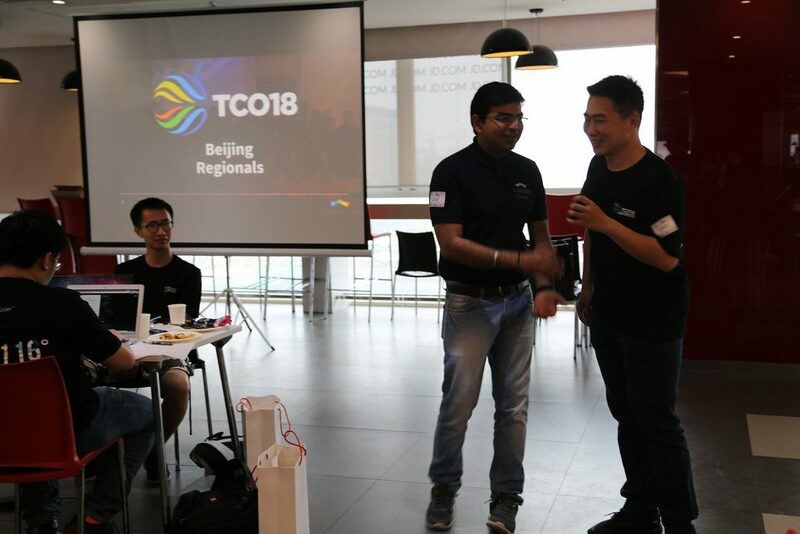 We hosted the TCO Regionals in Beijing for the third year in a row. 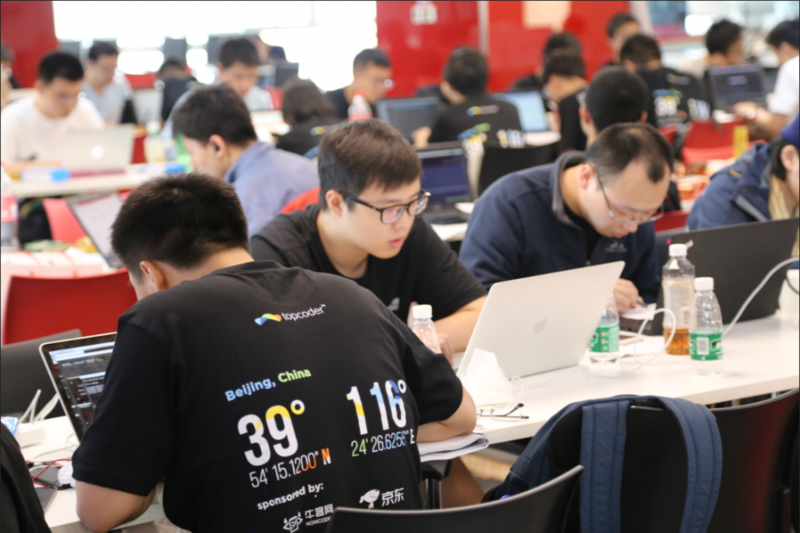 Some of the most outstanding algorithm coders from China and Taiwan gathered in one location for a great onsite competition. 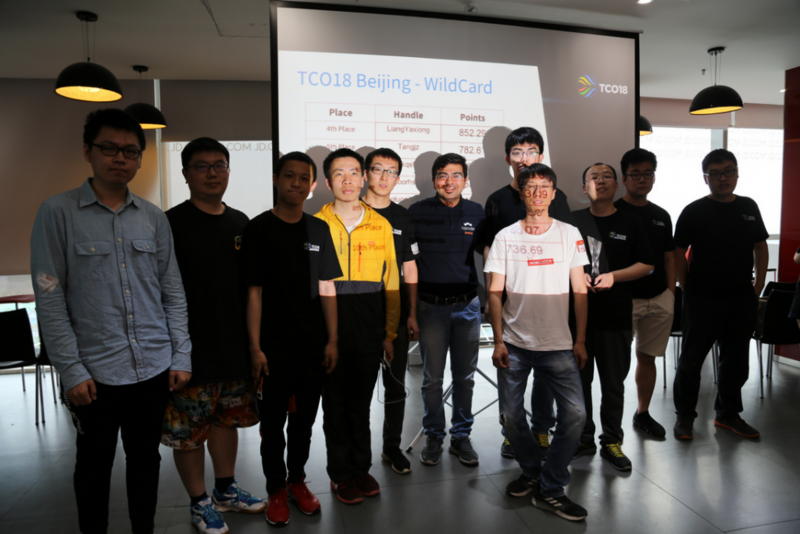 The competitors were chasing the 10 slots of the exclusive TCO online wildcard round to open the door for the TCO final ticket! 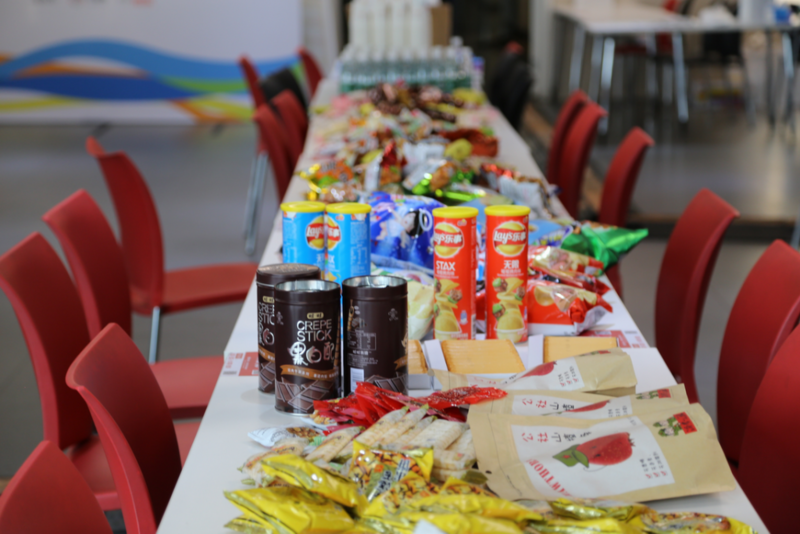 Our sponsor JD.COM provided an exciting venue to conduct the event, with delicious food, beverage and snacks! 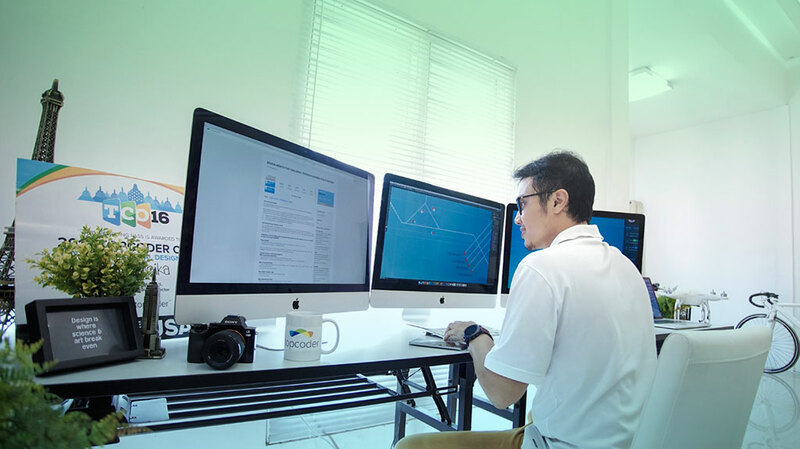 Nowcoder, our three-year sponsor and organizer, helped set up the event: the posters, banners, photo booth and T-shirts. 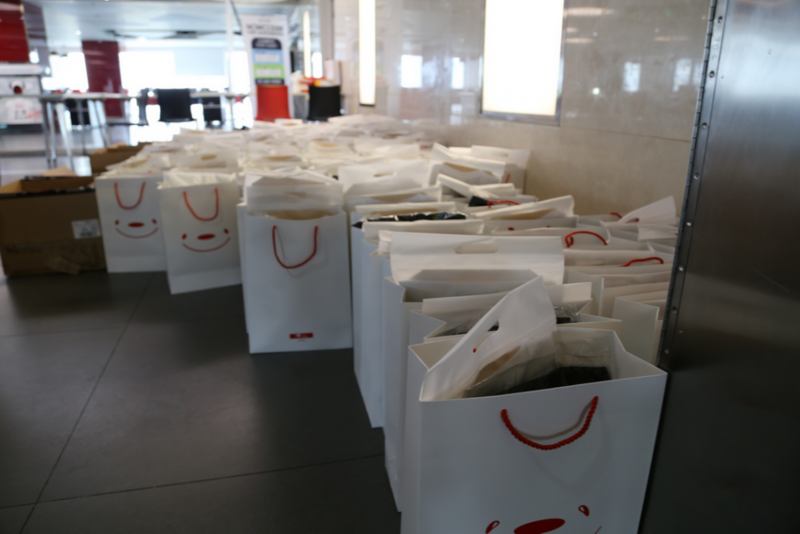 JD.COM and Nowcoder prepared a goodie bag for each attendee as well. Big thank you to our two sponsors! By 11:00 AM, a few members had arrived at our registration desk, grabbing their goodie bags and the Topcoder T-shirts. Soon the venue was full of attendees. While waiting for the event to start, we were having lunch, taking photos and playing games. Then we were finally ready to start the event officially. 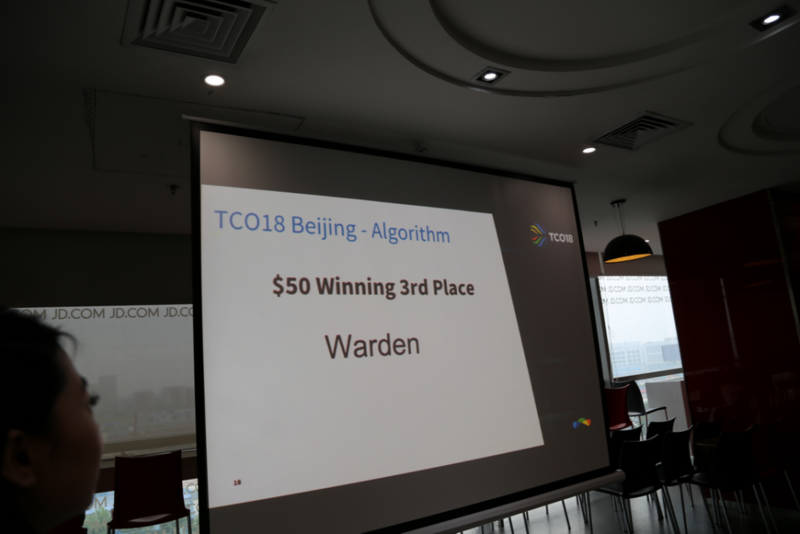 Topcoder admin Harshit came to the stage and talked about what is TCO and how we were looking for Algorithm Arena Architect, problem and editorial writers, I helped to translate what Harshit said into Chinese. 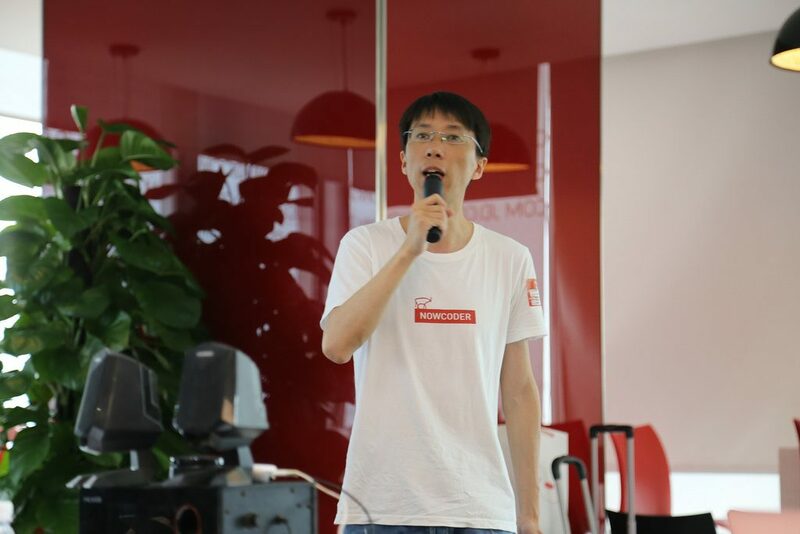 The session was followed by an interesting talk from JD.COM’s Chief Software Architect, Haifeng Liu sharing about the infrastructure platform of JD.COM, then Xiangyu Ye, the CEO of Nowcoder, shared how Nowcoder helps members practice programming and get good jobs. Finally, I came to the stage and gave a small talk about my Topcoder Journey. 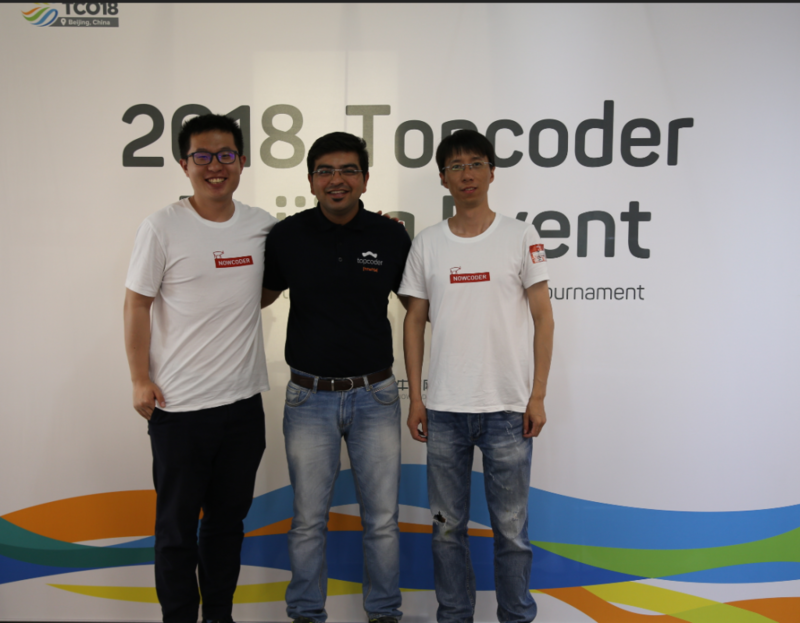 I introduced my interesting and learning days on Topcoder, as well as the good earnings, to motivate these talented algorithmists to participate in our development track. All members who AC’d the question in a limited time will share a RMB 888 (about $148) cash prize. 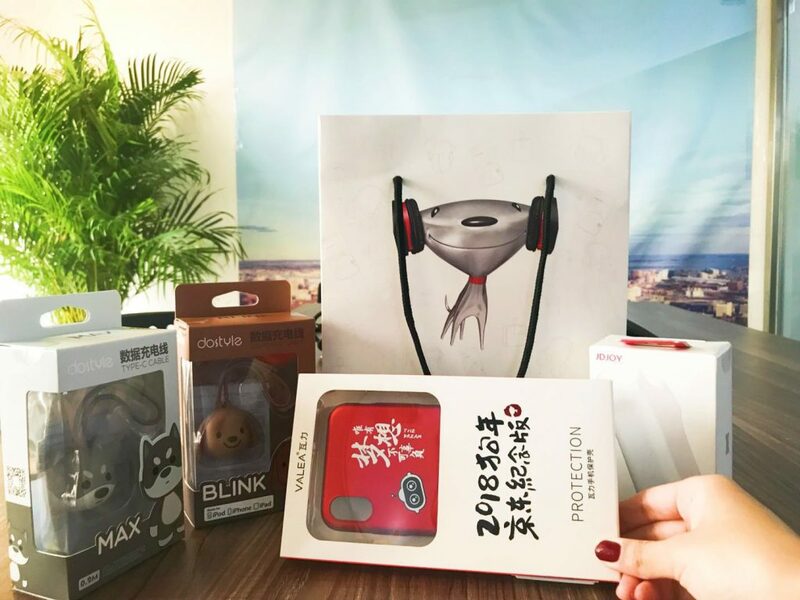 Finally, we had 15 members sharing the prize via WeChat. After a tea break, we announced the start of our exciting onsite SRM round at 3:00 PM. 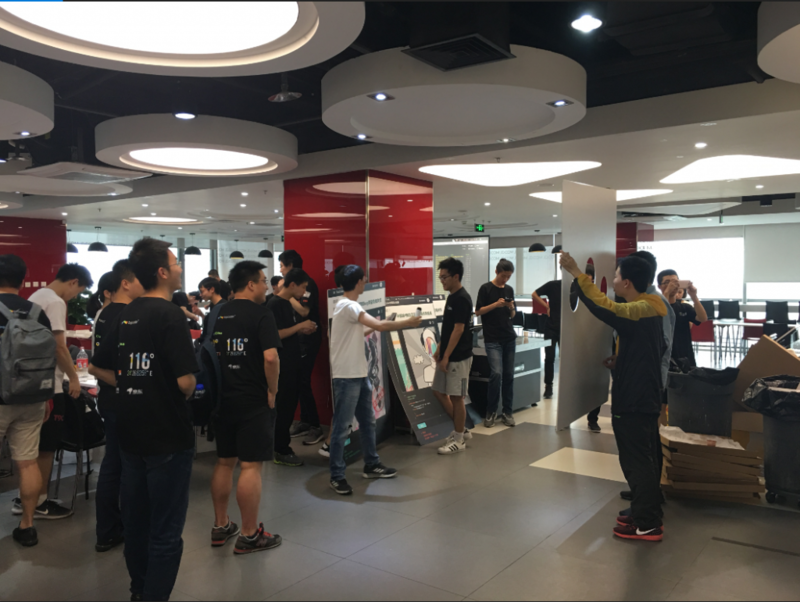 The venue turned silent and everybody came back to their machines to start competing. The leaderboard kept on fluctuating with members quickly solving the first two problems. Later we saw around 9 members had completed the difficult third problem. Our great members, ACRush, Blue.Mary and some reds and yellows solved the first two problems at an incredible speed and moving to the top ranks. But the third 1000 points problem was much harder and everybody was fighting for it. Finally, we had 13 submissions on the 1000 points problem. In the challenge phase, 9 out of 13 submissions of the 1000 points problem were challenge succeeded. It’s out of our expectation. 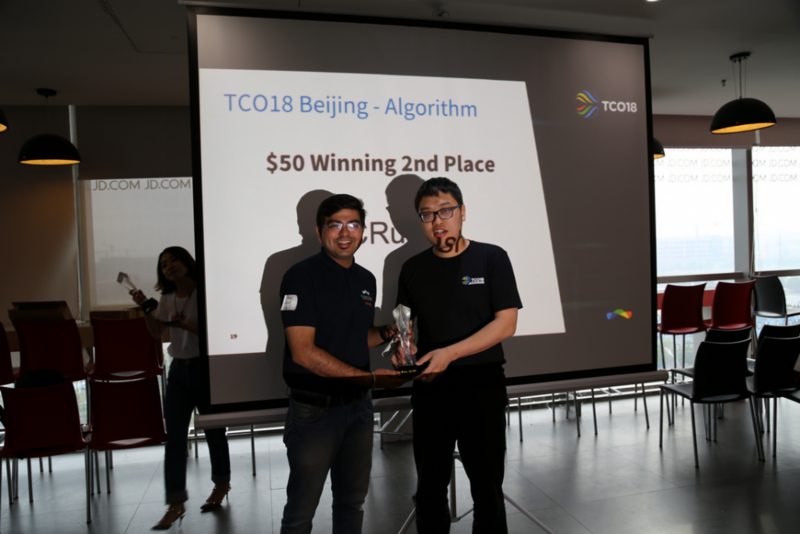 The most interesting part was – ACRush who was placed at 12 position at the end of coding phase ended at 2nd position at the end of the challenge phase. But the further unexpected result is, only one of the 1000 points submissions passed the system test! That’s really unbelievable. Blue.Mary won the first place by solving all the problems. 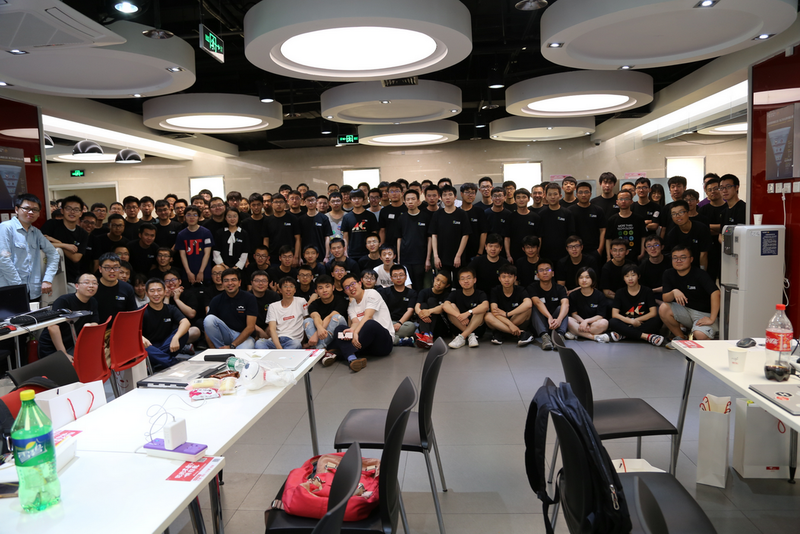 ACRush, the legend of Chinese programmer, took back his glory by winning the second place. The top 3 received a trophy and $100, $50, $50 cash prize respectively. 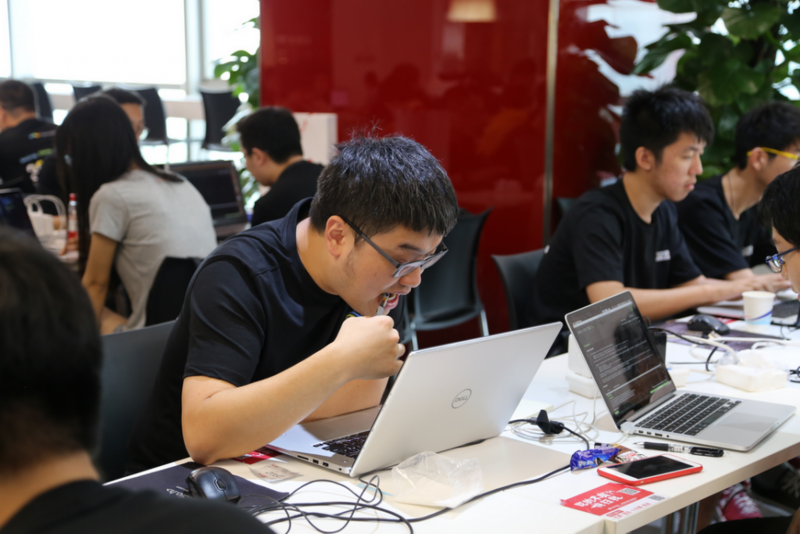 Additionally, our sponsor Nowcoder offered top 3 members an extra cash prize with 3000 RMB, 2000 RMB, 1000 RMB respectively. Big thanks to Nowcoder again! The top 10 qualified for the wildcard round to be held on August 25, 2018. They will fight with the winners from other regionals to get the ticket of TCO18 finals! 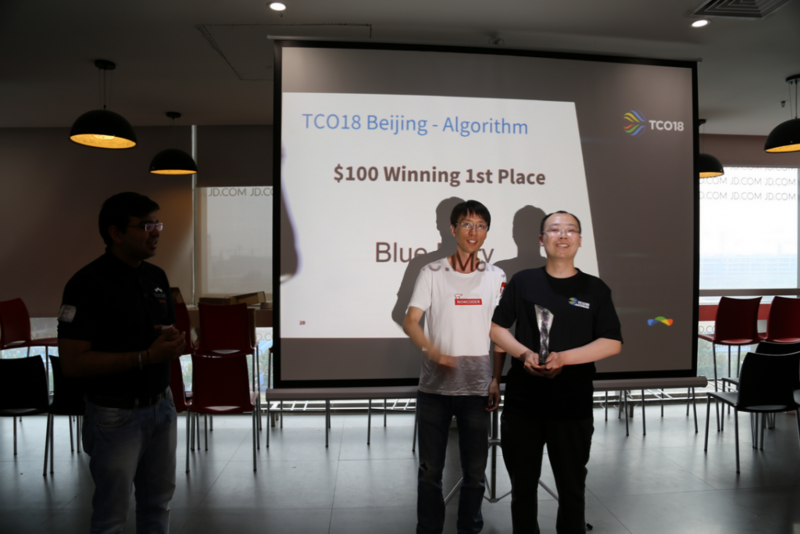 Our amazing TCO Beijing event was ended on a happy note. What a fun and exciting day it was! 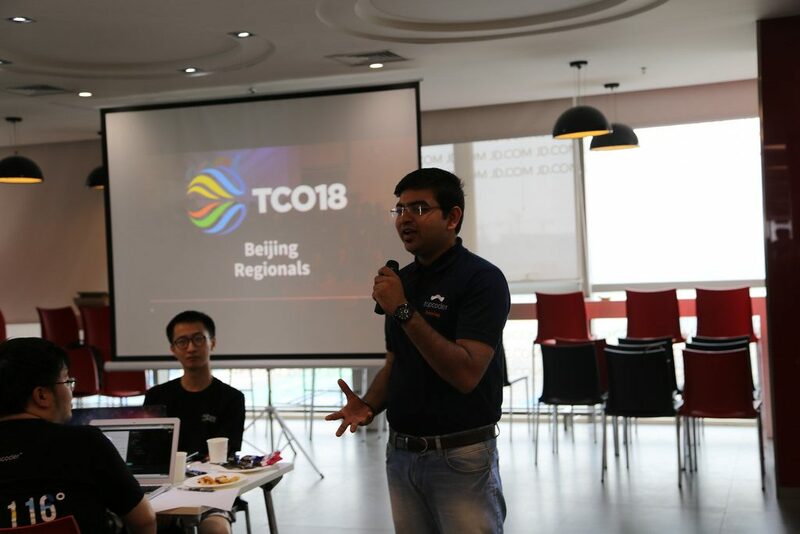 Thanks to everybody who attended and helped this event, thanks to Topcoder for giving me such a good Beijing journey to meet so many talented members. We are looking forward to seeing some of you in the rest of the events of this year, and seeing all of you next year! 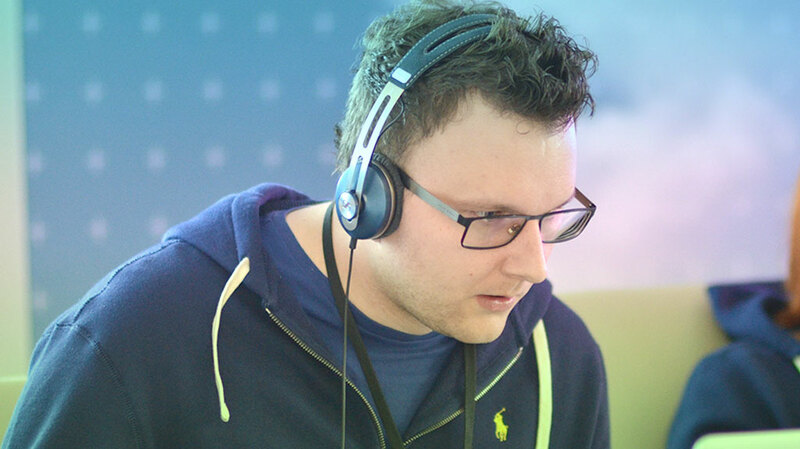 The Making of a TCO Development Champion – Sky_ is the Limit!